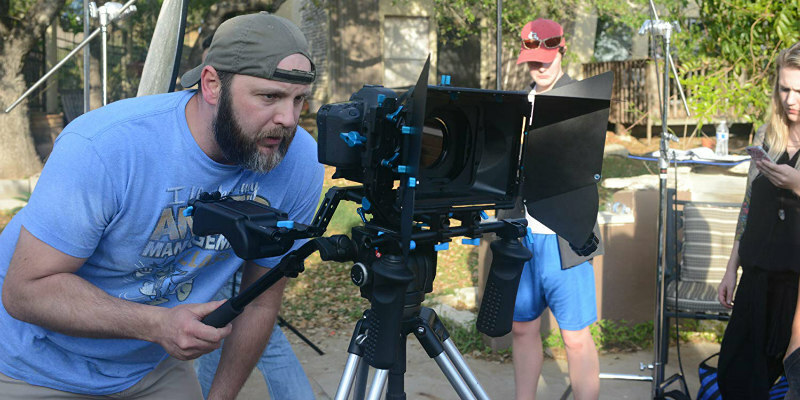 Joe McReynolds, writer/director of the new grindhouse throwback Inhumanity, waxes on the ups and downs of indie filmmaking. I don’t actually know. I can’t really put my finger on it. I have always had a pretty good imagination and filmmaking seemed like a great way to dream something up then make it real. I know in my late twenties I really started to look at movies differently. I started to be more interested in how to make them. So I started reading about how to make them, then in 2006 I really decided to take a shot at it. I took a 14 week course on filmmaking then just dove in. I am a learn by experience type person. I didn’t want to make a lot of short films and spend years cycling through film festivals. I want to make feature film movies that are marketable and that we can sell so that we can make more movies. We also want to be creative and artistic and have some hidden message in our work. It’s a balance I am trying to reach. I feel that you can only learn by making what you wanna make. I want to make feature length films so that’s what I am doing. No. I didn’t know anyone in the industry at all. Now I know a couple of people I suppose. Ford Austin has been in the industry for a long time and has really grown as an actor over the years. As far as “Knowing” anyone, no I do not. Maybe one day I will meet whoever it is I need to meet to allow us to make the stack of movies we have ideas for. They say it’s all about who you know. Right now we are working on becoming better filmmakers using what limited resources we have. Sony Hi8. I bought it at Best Buy in 2003. I used the Sony Vegas editing software that came with it. I made a short film called COKE with my nursing classmate Tony Hussey. Tony is also an executive co-producer on my current film Inhumanity. It was called COKE because it was basically a short film about a guy studying for a test who got thirsty and made himself a glass of Coca-Cola. I put the camera in the refrigerator, the cabinet - I had all these cool angles. Shot from underneath the glass to see the ice. Shot thru the glass as the coke was being poured. I mean this was pure cinema. It was groundbreaking… (laughs). Then I edited it all together and decided to make it black and white because that seemed more artsy (laughs). But yeah, that was my first short film in like, 2004. I have since lost that film since it was on a computer that crashed on me. I remember editing it on Sony Vegas and was just in awe of being able to shoot something then edit it. I shot some footage at the wax museum in San Antonio and edited it to Marilyn Manson's "Beautiful People" and had all these crazy zooms and cuts and filters on it. It was insane. Everyone I showed it to loved it. So I was hooked on editing after that. Then I said well if I wanna edit I need to shoot some footage and if I wanna shoot footage then I need to write some scripts. So here I am now.... Writer/Director/Editor. I am always working to be a better writer - I think it’s the building block of filmmaking. Javier Garcia (actor/producer/cinematographer) and I are fans of the Coen brothers and Stanley Kubrick. I also really like the style of the older grindhouse films. There is something about the chaotic looseness and the abandonment of the strict cinematic laws that appeals to me. Some people appreciate that and some don’t, but in Inhumanity we play around with a little of both. I think that’s why some people have trouble putting this film in a genre box. Audiences have been trained for so long to put every film in its own box and on this film I wanted to experiment with some genre bending and give the audience a little bit of a few different things. I knew I would get some pushback but that’s ok. I don’t mind the pushback and I kinda like that people are talking about it. It’s nice to not just have the same old thing in a genre film, in my opinion. We will see how the audience feels about it over time I suppose. Absolutely!! Our entire team had full-time jobs during this production. I am a Registered Nurse and have worked in Critical Care for 18 years. But my job is flexible, so that flexibility allows me to pursue a filmmaking career. My other cast and crew members work mostly 9-5 type jobs so they have to make a lot a sacrifices as far as using their paid time off. I also had two kids since my last film and went through a divorce, which was amicable and without complication. Then I had testicular cancer which was pretty scary but I caught that early and was able to come out of that without any serious damage… That all may be too much information but it is the reality of it all. Ford Austin, whom I had made friends with at the Bare Bones film festival when I was doing the festival run for my first feature film The Vern, also got into a serious auto accident and died seven times and spent years in recovery. So the film was his first big role since that tragedy. He’s pretty lucky to be alive. So yeah, we have had some obstacles for sure and a job, supporting yourself and maintaining a family is not easy. Diana Rose, one of our lead actresses who plays Dr. Campbell, and her husband Darrell just recently had a beautiful baby. They were both producers on the film and did an amazing job while juggling work and life. My fiancé Margaret Marchant and my best friend and filmmaking partner Javier Garcia both also hold down full time jobs and really had to make some sacrifices to bring this film to reality. I cannot say enough how appreciative I am to them and everyone else who made sacrifices for this project. I just can’t wait to be able to make films with them on a full-time basis without the burden of full-time jobs. We have a very talented, creative team and we will continue to push forward no matter the obstacles. There is no crying in filmmaking …. unless it’s for cinematic purposes… (laughs). I made a few short films years ago in that 14 week class. I made two feature-length films - The Vern and Inhumanity. I started to make Inhumanity, which was originally titled “Six Pack Sam,” as a short film but it morphed into Inhumanity as a feature-length film. Yes, it was privately financed by Jason Fought and Daniel Shih. Jason is a doctor. I worked with him at the hospital and we chatted about the project. I showed him some of the footage and he wanted to be one of Six Pack Sam’s victims. He had this crazy scene he wanted us to shoot with him in it and buckets of blood… (laughs). I was like ok man, look: one that’s crazy and two I can’t afford that. So he said he would pay for the scene and I said ok, cool. We paired down his scene quite a bit and hired Ben Ploughman to come in and do the effects. So we shot that and got some good stuff. We liked it and before you know it, him and Daniel were on board as executive producers. We still had a very limited budget and I put in some money myself as did Javier and Darrell and Diana. No, it isn’t based on anything personal. I just came up with the script out of thin air. As far as homage, I didn’t try to imitate any certain movie but I guess just as a filmmaker and watcher of cinema I have things that have left an impression on me. But I never really “tried” to pay homage to any certain film as much as just to a certain style. The films of the Coen Brothers, Quentin Tarantino, Kubrick and in general the style of the '70s and their use of limited resources. I really also wanted to have a musical score in the vein of the older Giallo cinema. I teamed with Tony Longworth, who is an amazing talent, and he really did a phenomenal job on the soundtrack. I encourage everyone to check him out. He’s from the UK and just a great guy and musician. He has the soundtrack available for purchase and it’s very unique and cool. Well it was a nonstop pitching process as things were always changing and obstacles were there to overcome. But I just gave them the script and told them what I wanted to do. They all gave me feedback and once we were off and running we just did it. The one thing I always made sure they understood was that I was going to finish this film. Nothing was going to stop me. I have been involved in projects before that never got completed and I hear some many stories of uncompleted films sitting on shelves because people just didn’t have the will to complete them. I promised them that would not happen with me. I will always finish what I started if I have complete control of the project, which wasn’t the case in the other unfinished project I worked on. We had so many people involved in this project; I wasn’t gonna stop until it was completed. There were many times this project could have been derailed but we always relied and adapted and weaved it together to get it to work. This really was a handmade film put together with grit and determination. I can’t say enough about how proud I am of the cast and crew. Well tt has gotten me a distribution deal with Rob Hauschild of Wild Eye Releasing, who is great by the way. Rob has been nothing but spectacular and a true professional. I am so pleased to have chosen him and his team. I wouldn’t be doing this interview if it wasn’t for him. So we will see if it opens any more doors as the film makes its way around. I think anyone that knows our story and can see the talent in this film should be willing to give the people involved opportunities to do more work. August 14th was the street date for the DVD, which is available on the shelves of Walmart. The DVD is also available for purchase online at Walmart, Amazon, Grindhouse Video, Best Buy and Family Video. Streaming will be available in the future on Amazon, Google Play, Vudu, Xbox and Overdrive media. 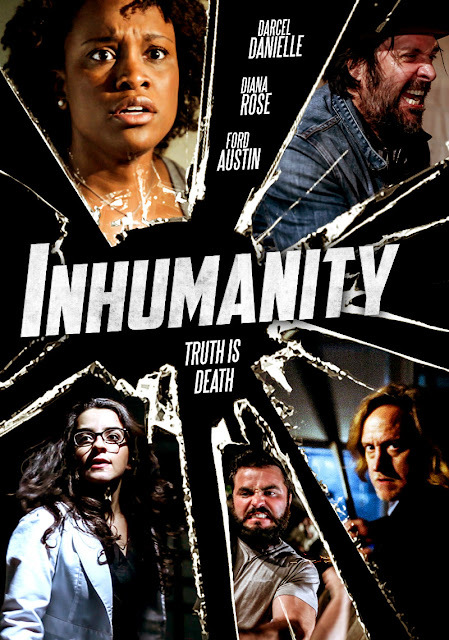 So follow us on Facebook and other social media platforms Twitter, Instagram using the handle @inhumanitymovie and of course our website inhumanitymovie.com. I will be adding new info such as reviews, interviews, etc. as I can. I hope everyone gives our film a chance and sits back, relaxes and just enjoys this first installment of the Inhumanity franchise. We have more films lined up and they are gonna get crazier and more fun… I guarantee it! I want to thank The Movie Waffler for this interview and appreciate everyone who took the time to read this.